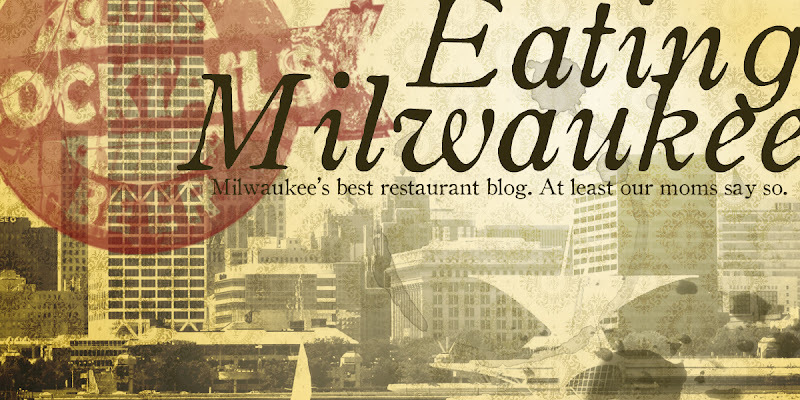 It's a new year, and the staff of Eating Milwaukee agreed we needed to get back to our roots. You'll never hear us complain about the rich, the spectacular, or the avant-garde. But often what makes a restaurant great isn't so much the breadth of its menu, it's how long that menu has been around. In the case of Jake's Delicatessen, it's been around exactly 56 years. So, how is it that we're so late to the party? 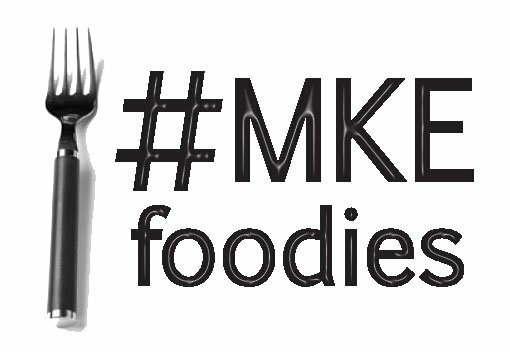 Jake's remained a relatively unknown to most of the Eating Milwaukee staff up until recently. With it's Bronzeville location, niche menu, and mostly take-out business, no one could blame us for not being on a first-name basis with the counter staff. But to pass Jake's by would be like passing up a Picasso at a yard sale: sure, you might not be an art collector... but c'mon! The actual prep counter is a full half the restaurant, running the length of the dining room. "I have the meat you've been dreaming of..."
And, that's when Andy elbows me in the side, and tells me that I'm missing an awesome shot of a hunk of Corned Beef being wrangled from the steamy depths. Meat I've been dreaming of? Hmph. Must've all been just a dream. I kept wondering why all of my shots were turning out hazy, until I realized that it actually was the smoke from the flat-top that was making the whole restaurant a bit... obscured. Our trip to Jake's was our new, permanent staff member, Adam's, first, so it would be rude of me not to start with him. Lauren had a Corned Beef as well as a bowl of Matzo Ball Soup, which looked, strangely enough, exactly like the others. Now, it occurred to me as I was taking these shots that none of this food is particularly photogenic: the corned beef looks mangled, the pastrami looks sort of like, well, I'll leave that one to the imagination, and the pastrami dog... well, it looks like a jumble of meat not even a mother could love. I get that. This food isn't pretty. Come to think of it, it doesn't taste pretty, either: this isn't delicate or particularly multi-layered. This is spicy, sour, brash, trash-talking mustard. This is greasy, peppery pastrami that may or may not give you some spectacular heartburn. This is fatty, tart, saltier-than-hell corned beef. This is a matzoh ball that is as much butter and schmaltz as it is cracker meal. And that's just fine with me. Andy's pastrami was, as we had heard, to die for. The hours spent in the meat-sauna had done it well, and it was fall-apart tender, spicy, and oh-so-salty. Mixed with the glorious brown deli mustard, it was a fine sandwich, indeed. His Reuben was equally fantastic, consisting of corned beef, sauer kraut, swiss cheese, and deli mustard. Thousand Island dressing is available on the side for any sandwich, although, as Andy pointed out, there was enough going on in his Reuben that the thousand island was far from necessary. What really tripped my trigger was the Pastrami Dog. THIS was a man's sandwich. Which is exactly why I was so intimidated by it. A 1/4 pound Vienna Beef hot dog, sliced down the middle and grilled, stuffed with swiss cheese, covered in sliced pastrami, and buried in a very, very fresh Miller Bakery pretzel roll. Smother in deli mustard, consume, and take a few Tums now, just to save the frustration later. Oy vey. What struck me as one of the tastiest aspects of the pastrami dog was the freshness of the roll: tough and chewy pretzel outside, squishy dough on the inside. Against the salty spice of the dog and the pastrami, the roll even tasted sweet -- which was a charming contrast, indeed. The Matzo Ball Soup didn't disappoint. Little bits of carrot, celery, and onion co-mingled with shreds of chicken, and gigantic honkin' matzo ball in the center of the bowl. The ball was fluffy, giving and tender, soaked with the flavorful, if not a bit overly seasoned broth. We all agreed it fared particularly well against Benji's, our current standard to date. Our meal from Jake's was all that one could ever want from a deli, if not all-out legendary. Jake's is the epitome of finding a niche, creating a memorable product, and providing consistent and satisfying experiences to customers. It's no wonder the business has been around since 1955. Jake's dogs, as far as I can tell, are the legendary Chicago Beef Franks from Vienna Beef. I'm fine with that. Vienna Beef has made an entire business out of one single, amazing product. Good for them. Unfortunately, they're from Chicago, which means you need to be careful, otherwise your hot dog might ride up on your rear bumper, zoom around you doing 105 mph, cut you off, then flip you the bird, all while a Wisconsin State Trooper is checking Twitter on his iPhone. I'm not bitter. Weird thing is, Jake's pastrami is from Vienna Beef, too. And other meat products are from Kelly Eisenberg (this fact is mentioned on the website as well as in the restaurant.). But does it mean that the deli experience is less authentic when the stars of the show aren't actually cured, smoked and aged on-campus? It's a tough call for me. 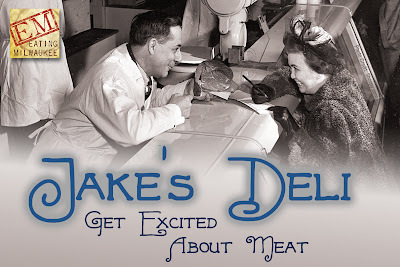 I've read that Jakes can go through up to 500 pounds of corned beef on busy days. 500 pounds is far beyond what one small deli is capable of producing... in a month. So, from a purely practical standpoint, if Jake's is doing as much business as they say (and the packed, standing-room-only restaurant we encountered at noon on a Saturday would surely attest to that), then it would be absolutely necessary to serve fully- or partially-prepared meats from a third-party. Still, I can't help but feel that, for $11, a sandwich should offer me a little more in the way of experience. I want to be able to imagine the brisket being tenderly spiced and salted in the sparse time before Shabbat begins. I want to know that the pastrami I'm eating was borne of a long line of necessarily cured meats, long before delis were retro fabulous. I want Itzhak Perlman playing his violin in the background. All of this thinking has gotten me a little cranky, though, and one fact remains: the food (everything we tried, as a matter of fact) at Jake's Delicatessen was delectable, and worthy of repeat visits. Our sandwiches were delicious. Our soup was divine. I even asked Adam to brush up on his Kaddish in case I died from the massive amount of meat we consumed. Prices not withstanding, we all unambiguously conceded we much preferred Jake's to Benji's. Atmosphere: C- or A-, depending on how you look at it. If you come looking for an insanely busy, noisy, chaotic deli, then Jake's won't disappoint. A-. If you're agoraphobic, or just have paneropyrophobia (true story... the fear of burned toast), you might not enjoy your visit very much. Did you know that there's a fear of beards? It's Pogonophobia. Either way, I don't think I'd actually want to sit in the restaurant and eat, beard or no beard. Just a little on the steep side, considering portion sizes. My Pastrami Dog was a steal at just under $7, but lean corned beef with cheese will run you a staggering $11.19. Engaging, but not overly quick. Our orders were correct the first time, and we didn't have to wait particularly long. Everything we had was impeccable, if not just a touch on the heavy side. But you don't go to a deli for low-sodium diet food, now do you? http://www.jakesmilwaukee.com/ - WARNING! Prices on website are NOT ACCURATE! Haven't been over to Jake's in years. But, I suppose it's time to give it another go! Looking forward to more divey delights from Eating Milwaukee in the New Year!! BTW - I've got a great concept for a series, if you're interested.